When artist Nitin Mukul invited me to visit his work-space and to show me his latest work called Haal, I discovered the possibility of creating paintings by means of which transcend the conventional medium associated with painting. I extracted the above quote from an early statement by May Ray before he became better known for his photographic techniques during Dada and Surrealism. The statement mainly refers to painting on a flat surface and how the material changes and shifts of color and textures of pigments are driven by a creative force of the artist. In Nitin's Haal, I recognized some correlation to this statement, that is to say the expressiveness of the work did indeed reside in the materiality and his choices of colors and different textures in the pigments. However relating to the latter part of the statement about the possibility of form invention and organization, Nitin left much of it up to chance. His approach went beyond conventional methods of applying paint to the surface and thus the work became a kind of a performance in real time. I named this post as "motion picture" because Haal is quite literally a painting in movement while its metamorphosis becomes the core of its life and creativity. Primarily, Nitin is a painter who makes large size canvas paintings with oils and acrylic paints along with pigment that he extracts from tea, which is traditionally used in Persian miniature paintings. In parts of Haal he also used turmeric, charcoal dust, and other non conventional media, some connected to his Indian heritage. Sometimes inspired by photographic images, his paintings are mostly abstract with vivid colors that would make your retina pulse while gazing at it. 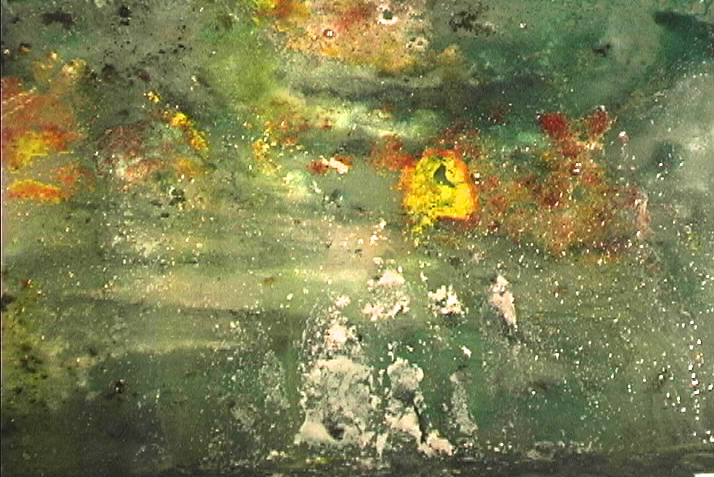 For Haal, Nitin used a video camera and filmed a painted scene that starts off looking as if a natural landscape. The ambiguity of Haal starts from the opening shot when shapes and textures all seemed quite far apart from each other with distinct placements. At first, it feels as if one is looking down from an alien spaceship that is about to land on a foreign planet, then the soundtrack starts to foreshadow a sense of adventure and action. 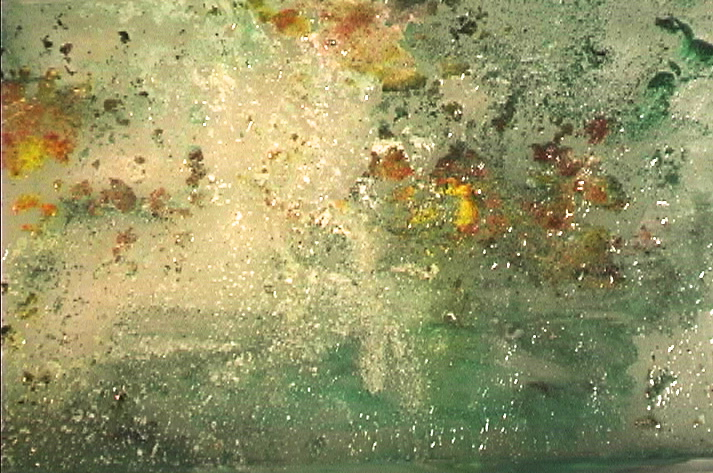 As the liquid begins to disintegrate the different pigments on the surface, the painting becomes active and unpredictable. For this work, Nitin set up the initial composition and then left the composition to de-compose on its own as to form new terrains of color compositions with organic and natural mixtures in different variations. Furthermore, this process conveys a visual effect that plays with viewers' perceptions of scale. While each shot suggests of satellite like views of a large landscape when in fact each element contained within the composition and their overall dimensions are quite small in real life. 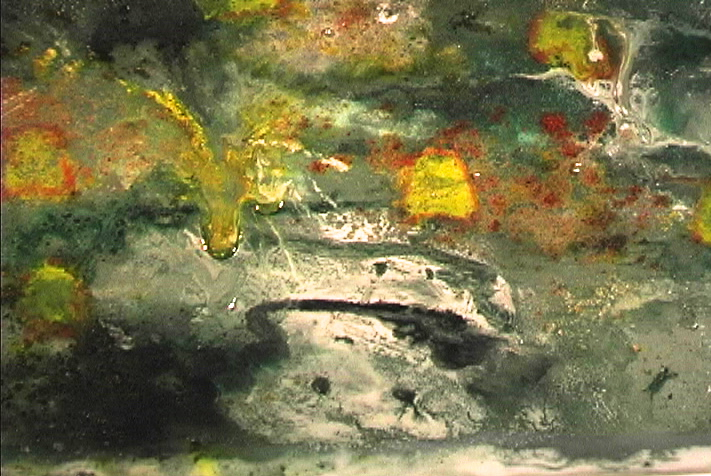 With the passage of time, the melting ice permeates the surface and disrupts the original composition, and along the way it gives form to new compositions without pre-meditation by the artist. I translate this saying as we may only fulfill the task at hand but we are not and should not expect to have full control of the results. Relating back to the beginning when I mentioned Man Ray's impression of creative force and expressiveness of paintings, for Haal is a confetti of color-paints and pigments, textures and movements and that its material metamorphosis breaths life into the otherwise a still image. Further more, it being a video work with sound there is an added dimension. In other words, while watching this video, not only is the moving transformation fascinating as it takes different forms on its surface but at the same time the sound track complements with even more texture and adds another layer of mystery to the whole experience. Haal premiered at Aicon Gallery in collaboration with Jace Clayton (DJ Rupture) who composed and performed the score live. Nitin is currently finishing up another large painting and there are editions of 5 digital C prints on rag paper available from this piece. If you wish to see an excerpt of Haal, click here. *Man Ray (1890-1977) Statement. Art in Theory 1900-2000: An Anthology of Changing Ideas. Ed. Charles Harrison and Paul Wood. Blackwell Publishing, 2003. **This is my personal translation and revision of the verse found on this website. ***The explanation of the title was provided by the artist.